The Mac includes a fantastic command line tool called textutil which allows for quick text file format conversions, translating almost any text or word document type into another. We’ve discussed textutil for a variety of uses, but typically it has been for one-off conversions of a specific file into a new file type. This time around we’ll focus on batch converting a group of files that are in the common Microsoft Office “DOCX” format, which is basically a compressed XML version of a classic Office DOC file, into a simple TXT or RTF file format, which has greater compatibility. Because textutil is a command line tool, users should be somewhat comfortable using the terminal before diving in, this is reflected in the first examples shown for those who know the command line well enough. If you’re new, though we will try to make it easy enough that almost anyone at any skill level with Mac OS X should be able to follow along. The “-convert txt” or “-convert rtf” flag tells textutil to convert the files into the given format, and the rest of the command string is simply a path to the files in question. Then, a wildcard * is used with the .docx file extension to tell textutil to convert everything in that specified directory. The freshly converted rtf or txt files will appear in the same directory as the original .docx files, the original dock files will not be overwritten or modified. That’s it, you’re all done. Obviously the txt file format is more universally readable than rtf, but RTF files maintain some formatting better than txt. Use whichever is necessary, or depending on the complexity of the docx files in question. The new .txt files will appear almost instantly in the same folder as the original .docx files, they even have the same file name with the exception of the new file format extension. 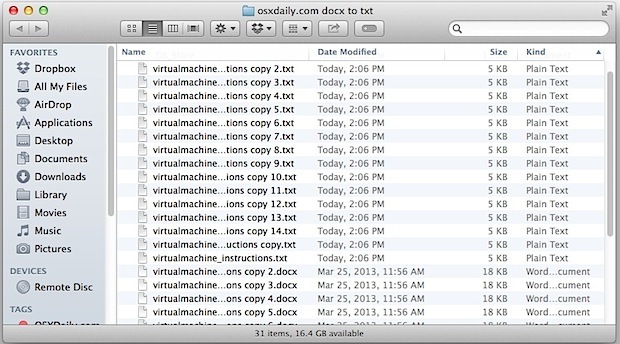 If you can’t tell the old file from the new files apart, be sure you have file format extensions set to visible in the Mac Finder to easily show the difference. Thanks to James Harvard for the tip idea. so docx conversion to rtf is probably interesting as well as it is supposed to preserve the formatting. awesome tip! Thanks a lot!! This is great! A real time saver! Error reading /Users/me/myProject/myBook.docx. The file isn’t in the correct format. what can i do to fix this or are there alternatives. thanks though.